The Restonic Comfort Care line is one of the best reviewed and highly recommended groups of mattresses in recent history. The Ashton Plush is a double-sided, soft but supportive model that has a focus on quality but carries a reasonably low cost. Low motion transfer due to thick foam encasement, "Marvelous Middle" construction, strong coil unit and memory foam are a few great features of this model. The Ashton Plush is yet another Restonic Comfort Care mattress that offers more than most premium mattresses in the industry for a lower price. The line has great reviews and has won Consumer Digest Awards so, I was extra critical of the product. I came to find that their specifications were very detailed and that they offered mattresses that were more like the ones that were popular when I was younger; heavier, double-sided and very sturdy. 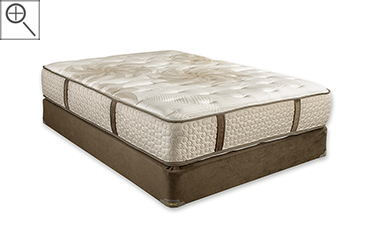 I rate this one around a "3" (of ten) on the firmness scale so, it's for those who like a softer mattress, while still getting proper support from a long-lasting and tempered coil system.